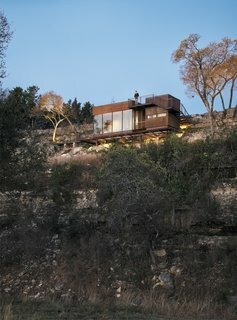 "The 450-square-foot building is nestled below a limestone cliff-edge, and has to be ‘discovered’ when approached from the top of the mesa," explain the architects. 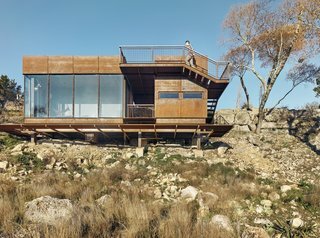 "This gradual reveal of the building strengthens the unfolding landscape panorama made possible from the unique vantage provided by the structure." 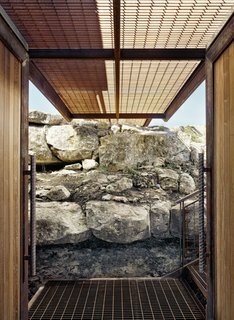 Expressed as a "jewel box in the landscape," Clear Rock Lookout is simply clad in large expanses of double-pane glazing and rusted steel, which will naturally weather over time to blend into the dusty surroundings and conceal the structure’s presence from wildlife. 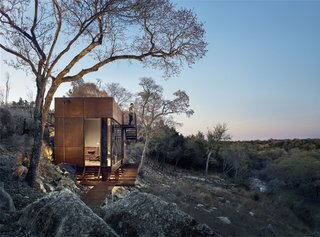 In contrast to the glazed writer's studio, the hunting blind is punctuated by two thin windows. 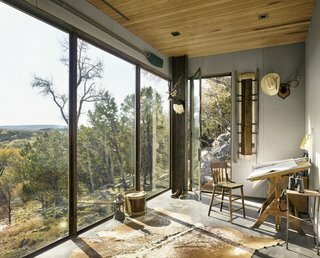 Restraint was also exercised in the design of the interiors, which are minimally dressed with polished concrete flooring and warm timber materials throughout. 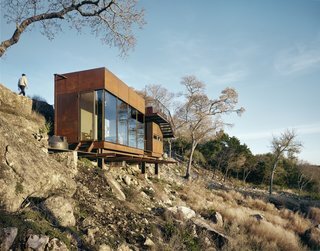 The interiors were designed with a "minimal and rustic Texas feel," say the architects. The ceiling is tongue-and-groove pecan wood. 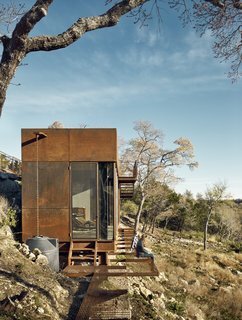 The writing studio is located on the southern end of the structure and is separated from the hunting blind by a breezeway and sliding doors. 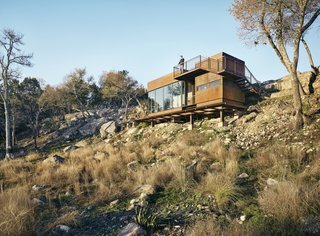 The lookout deck is located atop the blind. A glimpse of the breezeway beneath the grated metal footbridge. The doors and accents were constructed from ipe wood. 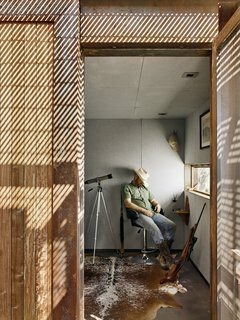 The hunting blind is a small and square room, furnished with a cowhide rug, two guest chairs, and a hunting bar. "The remoteness of the site made a challenge to find contractors and craftsmen interested in working on the project," says Stephanie. "However, we were lucky to find a great crew in the end that brought this unique structure to life." 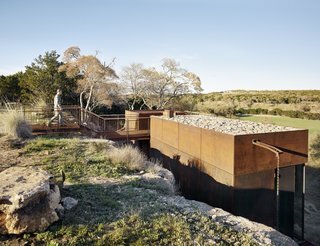 "The modern form contrasts with the Hill Country vernacular used on the rest of the 1,000-acre West Texas ranch," notes the firm. 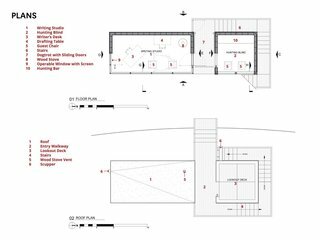 A low-impact design approach informed the compact, elevated footprint and grated metal walkways. Rainwater is channeled from the roof (covered in local stone) into a rain barrel. Clear Rock Lookout seen at dusk. 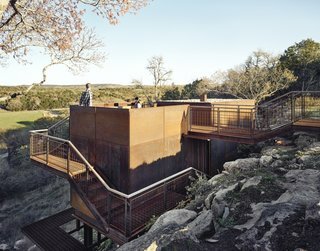 Lemmo Architecture and Design received a 2017 AIA Austin award for Clear Rock Lookout, one of their first commissions. Clear Rock Lookout floor plans.